According to the Portion Fix materials carb cycling is designed to help you temporarily shed weight quickly in a healthy manner. It should only be used when you need to drop weight for a specific event. The carb cycling plan can be used for 3 weeks max with a 3-month break before doing it again. The regular carb cycling plan involves two days of carb depletion followed by one day of regular eating. On the modified plan you simply switch the two and do one day of carb depletion followed by two days of regular eating. It’s a great way to give carb cycling a try if you’ve never done it before. I will be doing the modified carb cycling plan this week and the regular carb cycling plan next week to get ready for my 20 year Rangerette class reunion. Carb cycling is one of three different eating paths on the Ultimate Portion Fix. If you’re looking to learn more about nutrition and healthy eating for life I would highly suggest purchasing the program. By purchasing Ultimate Portion Fix you will also get EARLY VIP ACCESS to the new real-time 21 Day Fix & 21 Day Fix Extreme workouts starting April 1st. 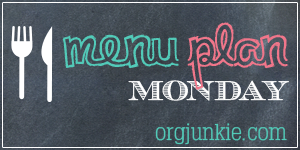 The weekly menu is a word doc so you can download and make changes to suit your needs. Just click on the image below to download, edit and print. I’ve included the regular menu format and the Ultimate Portion Fix Carb Cycling Modified Plan Container Count Meal Plan Template.